I have a limited quantity of the newer PRC-77 squad radios. 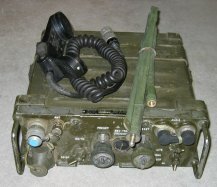 Like the PRC-25, these radios tune 30-75.95 MHz. FM in bands 30-52.95 MHz (Lo) and 53-75.95 MHz (Hi) with 50 KHz spacing. RF power output: 1.1 to 2.0 watts; 150 Hz squelch. Because the radio is all transistors it only requires 12 to 15 volts for operation that is supplied by a battery (NOT INCLUDED) or the AM2060A. The radios have contract dates anywhere from 1975 to 1981. These radios are complete have been realigned and tested, and are guaranteed to meet or exceed their original specifications. The radios are in good condition with no major dents or gashes but the paint may be chipped and scuffed. The insides are guaranteed to be clean and free of corrosion. There may be unit markings in black paint that is easily removed with lacquer thinner if you desire. Each radio is equipped with a battery box, but the color of the paint on the battery box might not match the color of the paint on the radio. These radios are being sold with a money back satisfaction guarantee. If you are not happy with your purchase you can return it within 10 days for a refund of the purchase price. PRC-77 Used, guaranteed, $ 399.95 plus actual shipping. To operate this radio you will need a handset and a battery and antenna. (sold separately). For accessories like handsets, antennas etc. for these radios CLICK HERE. NOTICE: These radios operate on frequencies that require a FCC license. It will be the responsibility of the purchaser to obtain the proper license and operate on the proper frequencies. I am not to be held responsible for improper operation.